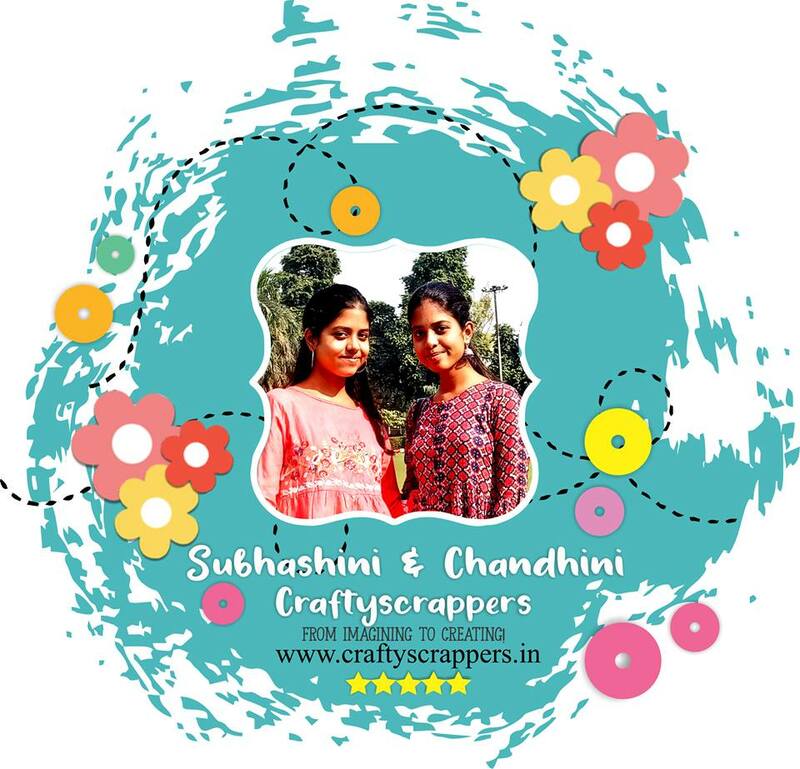 This is Subhashini & Chandhini, Creative Design team member at Craftyscrappers. 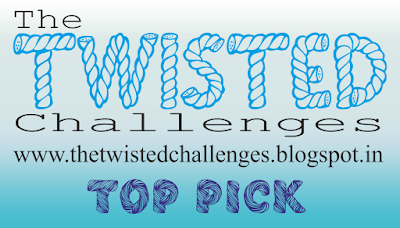 We are here to share our DT inspiration post. We have created a card using coloring card set from Craftyscrappers, which is a part of the Craftyscrappers April card kit. 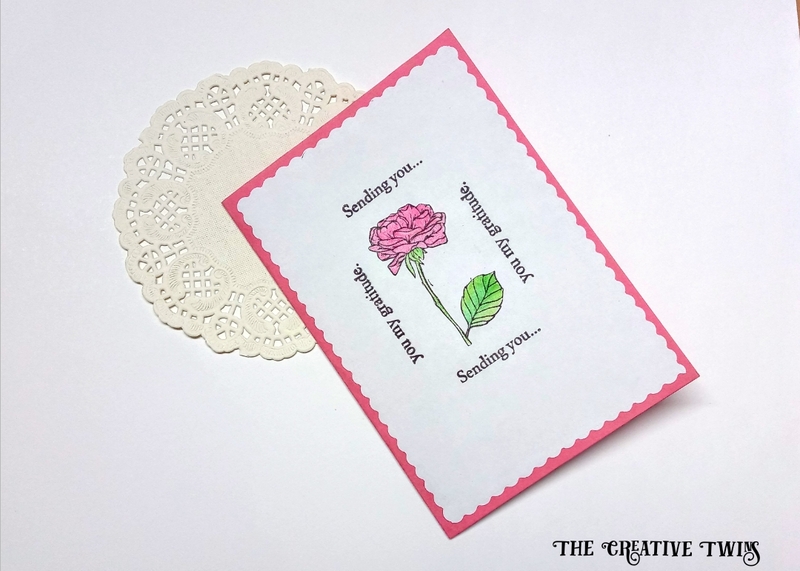 This card was quicker to make than other cards in that we didn't have to stamp, it was ready to color. Firstly, we need to color the Coloring Card and fussy cut it. Then, we will create grass background using Craftyscrappers stencil- Create a Scene and Craftyscrappers Forest green ink pad and blending foam. 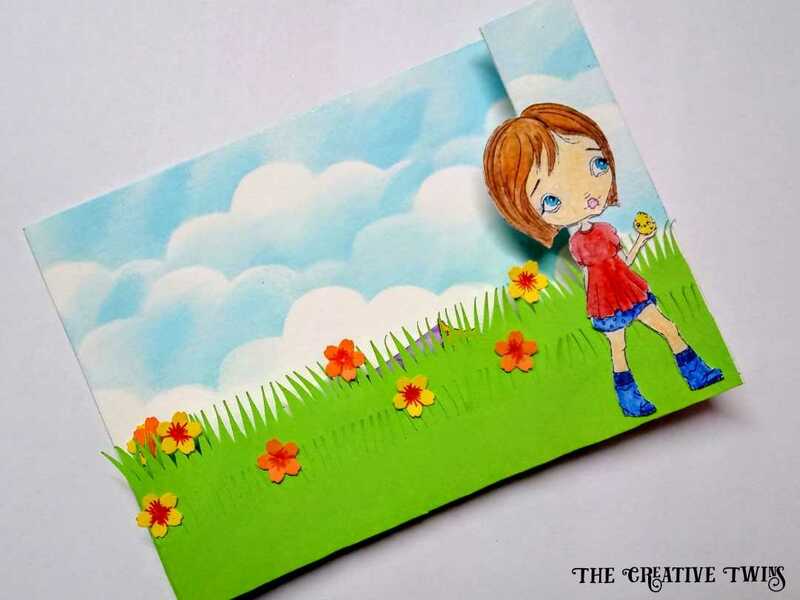 Likewise, we will make clouds using Craftyscrappers stencil- Create a Scene. Once we are satisfied with the background, we will add foam tape on the backside of the fussy cut image and adhere it on the cardstock. The addition of foam gives dimension to our card. 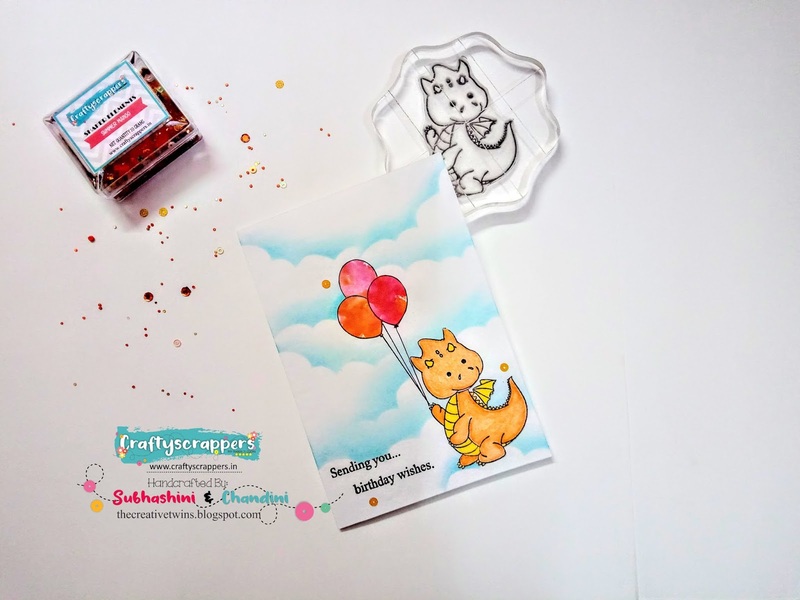 We then chose sentiment of our choice- Craftyscrappers Party bears stamp set and stamp it on the cardstock to complete our card. 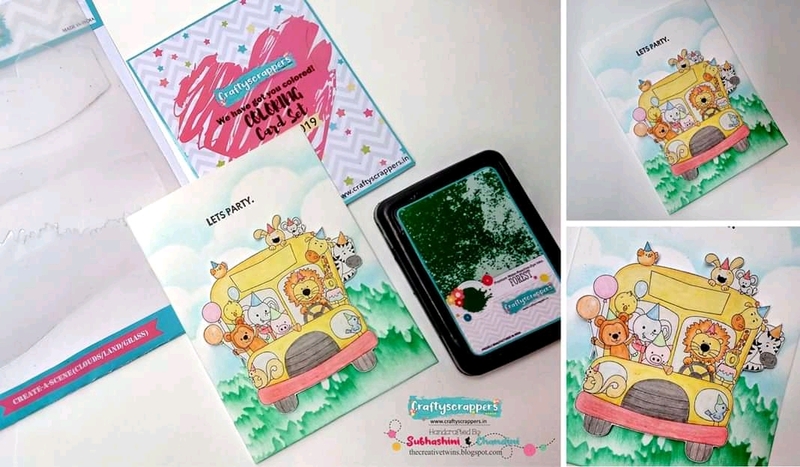 We, the Creative Design team member at Craftyscrappers are here to share review about the newly launched April card kit. We just loved it- the packaging is great and quality of stuffs is awesome. You got to try it to believe us, and we are sure you will be satisfied with your purchase. Have a look at the card kit contents. 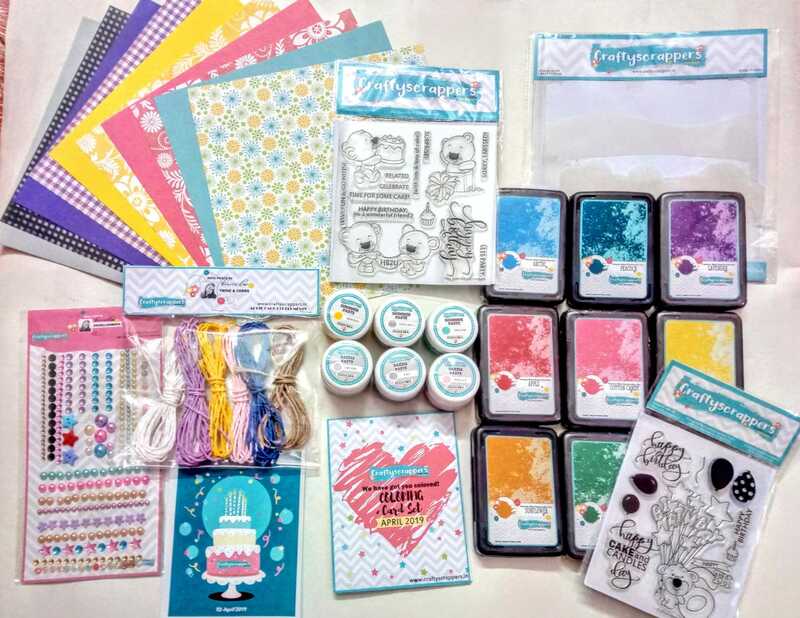 This card kit has got all the things needed to make a card, from stamps to embellishments, it has got you covered. This kit is perfect for newbies, as it has all the things needed to make a card, you don't need to go searching for all the supplies. 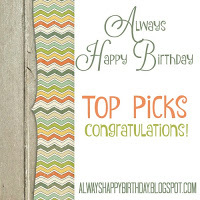 There are 2 stamp sets that are perfect for birthday projects, it has got great sentiments and adorable images. There are fun balloons, our all- time favorite- cute bears, small cupcake stamps and handwritten sentiments, which are perfect for all your birthday cards! There is a stencil, perfect for creating beautiful background scene. The kit has got masking sheet which can help you transform images by combining two or more images. They come with a backing sheet, so that you can re- use them. It also has acetate sheet, so you can experiment with ink smooshing, water coloring or create gorgeous shaker cards, and have fun. It also contains Shimmer paste and Dazzle paste, you can use them to add shine and sparkle to your projects. 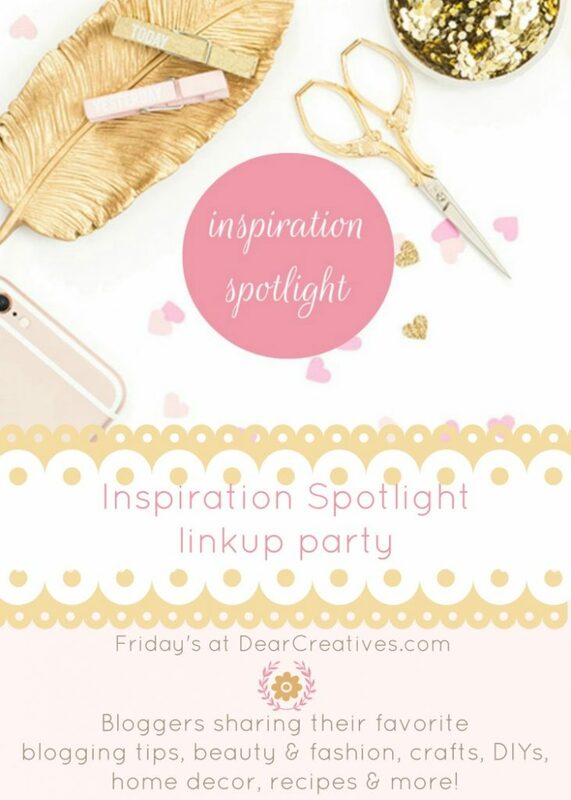 We love their shimmer and dazzle paste for their versatility, and it can be used in cards, mixed- media and what not? Ain't birthday all about celebrating special ones, go ahead and use them to add sparkle to your cards. 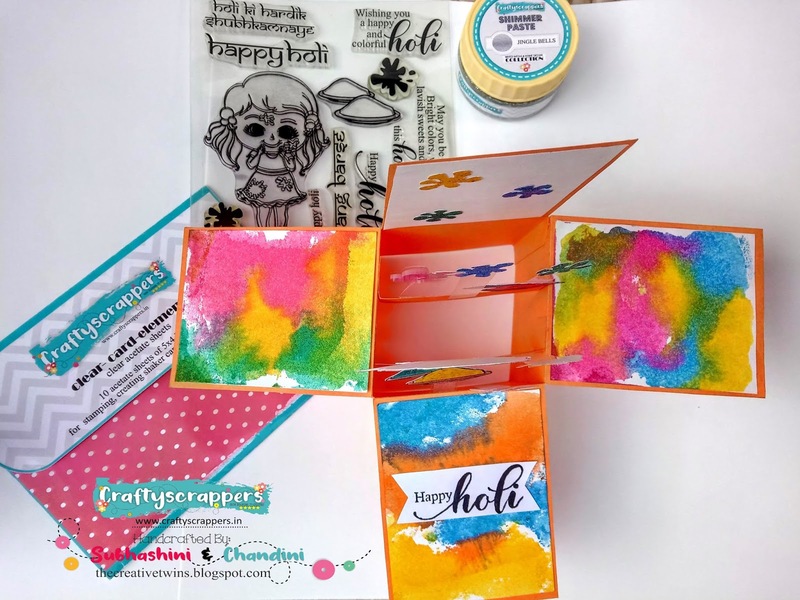 Craftyscrappers has newly launched ink pads, there are 16 different colors, there are 8 colors in this kit. 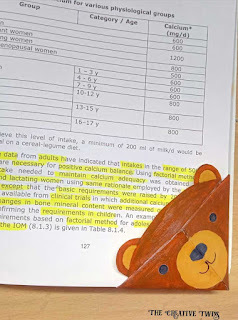 The ink pad has bright colors, these are water-reactive. You can do ink-blending, water-coloring, stamping and a lot more. These are stackable, that's a plus point, as it can save space!! The best part is that the label gives the exact shade, so no need to make swatches. We have to mention the coloring card set which is great according to us. 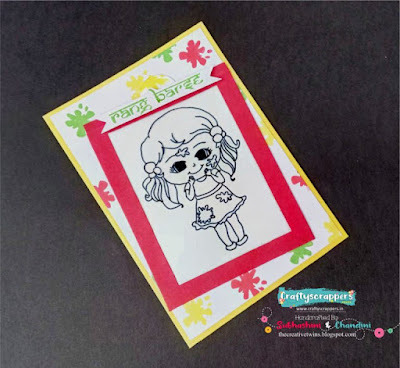 When you are running short of time and have to make card quickly, these coloring card set comes to the rescue. You don't have to find stamps and inks, just color them, detach and attach to card base, and you are good to go. How cool is that? 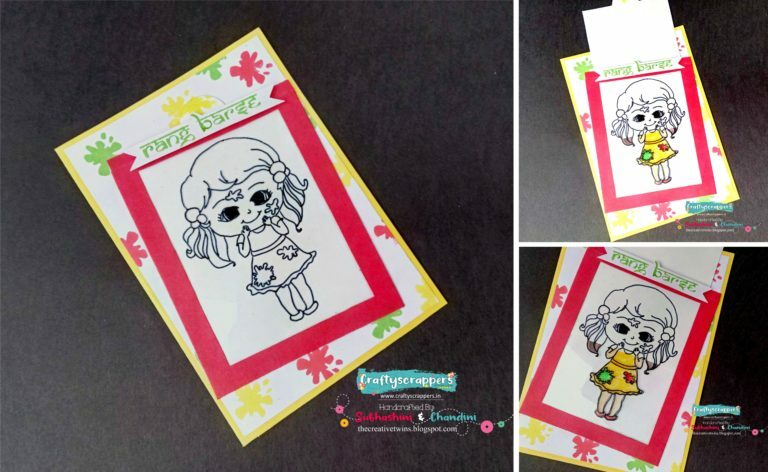 The quality of these coloring sheets is awesome, very smooth and great for water-coloring. Last, but not least, there are embellishments and twines in coordinating colors, perfect for that finishing touch to your projects. All in all, this card kit is awesome. Kudos to Craftyscrappers for this amazing kit! What are you waiting for? The kit is available from April 1-30. Grab it at a launch price of 2000 INR. The original price is 2500 INR. Now, that is a great deal!!! Buy it here. 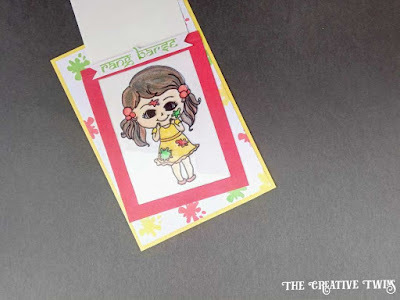 We are back with bookmarks, you might wonder why bookmarks, why not cards. 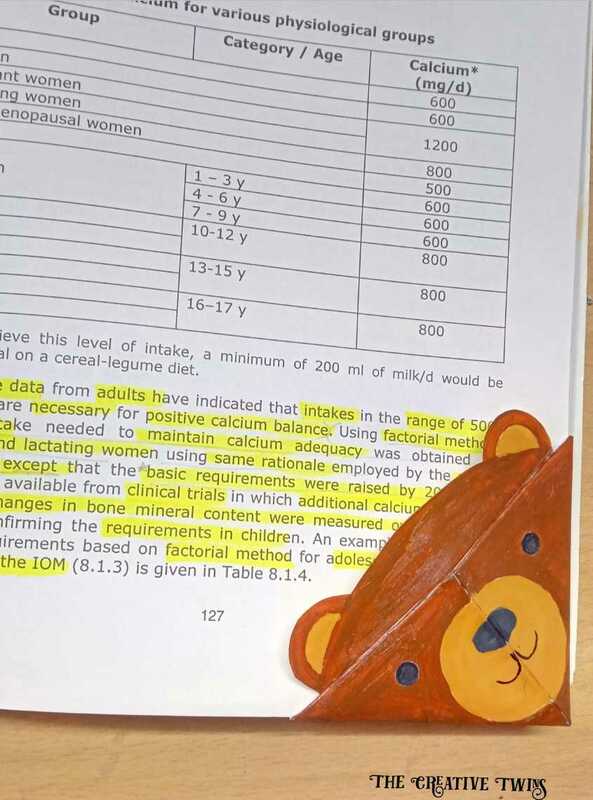 It is exam time, that calls for some reading and hence bookmarks. 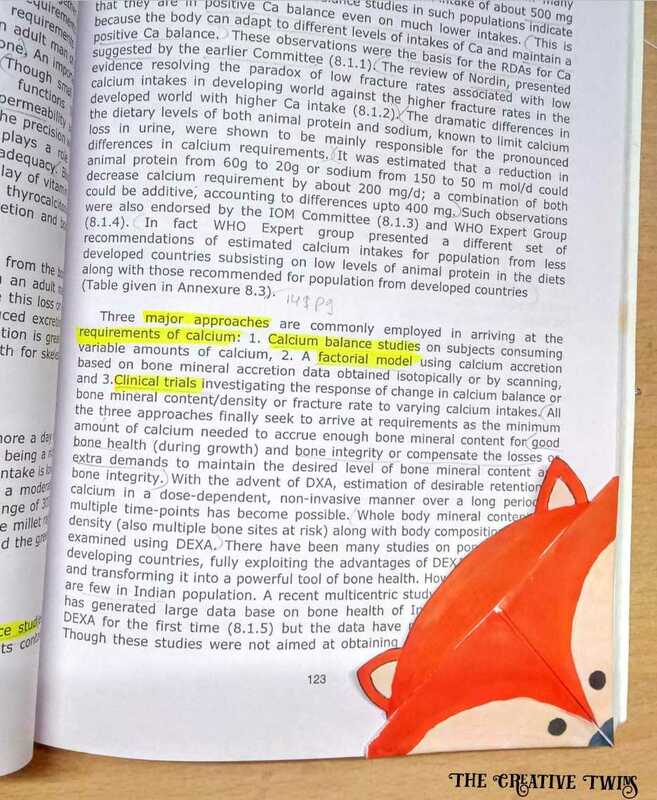 You might be familiar with falling asleep while reading, and next day searching the page you last read, bookmarks come to the rescue. 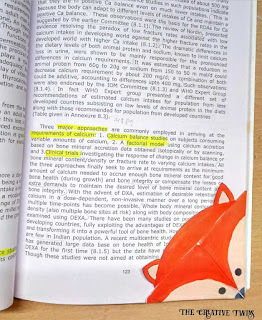 Let's get straight to the bookmarks, we love how easy these corner bookmarks are. This is our latest card, made with stencils and color pencils.We wanted to use this butterfly die cut since a long time, finally got to use it. 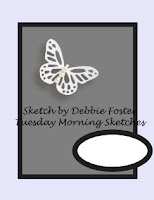 We got this die along with some other cute butterfly themed craft supplies as part of Secret Santa goodies sent by Mrs. Valery Anne (so sweet of her) when we participated in her Butterfly Challenge. 12. 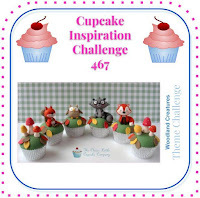 Kraftin kimmies CH #475 - CELEBRATION! 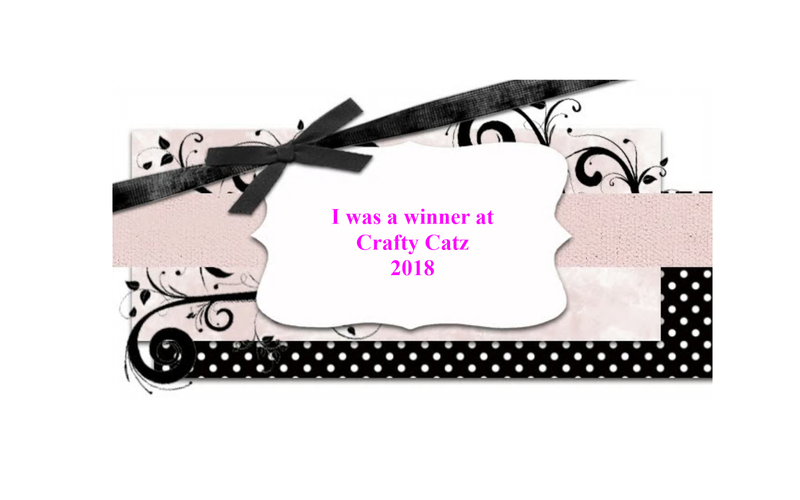 We are proud citizens of town Craftyscrappers. Our crafty town is being run by Mayor.Konica Das and Deputy Mayor.Jesse Zedek. This month we are celebrating 6th birthday of our town and we like to invite you to visit my crafty museum . Every year, we have crafty tourists visiting our town and joining us in celebration. 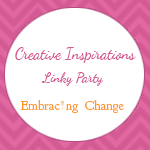 We invite everyone to join us on this occasion and hop on & off our crafty bus. 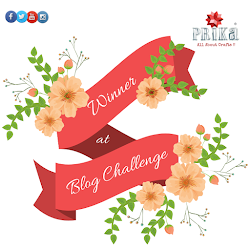 Our blog bus runs from April 2 until April 16 and we have prizes for a lucky visitor on May 5, who will receive lovely gifts from us. 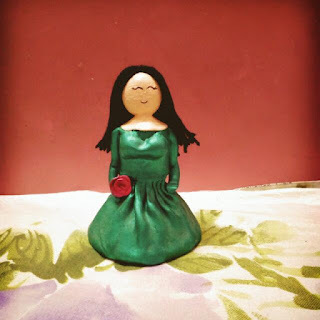 We welcome you to see one of our unique crafty creation made for this special occasion. We stamped the dragon image from Magical birthday stamp set, colored and fussy cut it. Then we used blending foam and sky blue ink to create cloud with stencil. We made the balloons by ink smooshing on a piece of cardstock, allowed it to dry and hand- drew the balloons and cut them. Finished off with sentiment from Boat love and Sending stamp set and sequins to complete the look. Thank you for visiting my place. Hop on and get off at the next stop (SWEETY GUPTA) and enjoy marvellous master piece created for you. 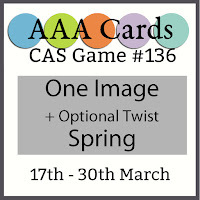 Today we have a CAS card to share with you all. We don't make CAS cards often, but admire the beauty and simplicity of them. 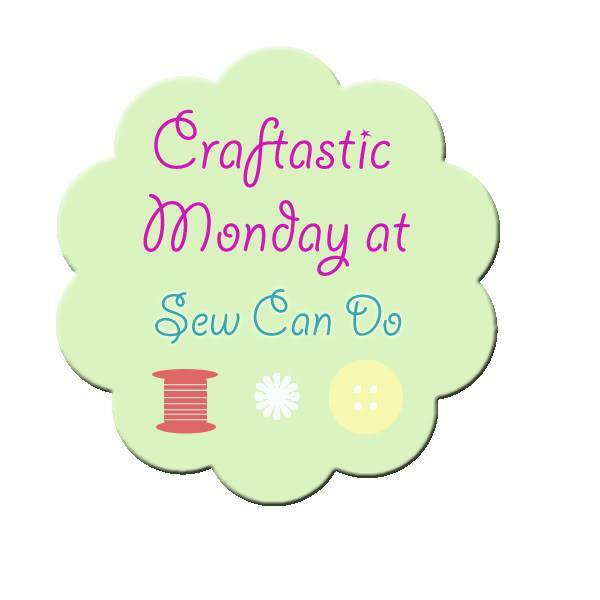 We have used Sending stamp from Craftyscrappers. 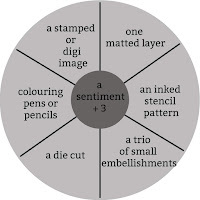 We have stamped the sentiment around the image in a frame to bring the focus to the image. We have cut the panel using decorative scissors. We are happy with the outcome. 2. Craftangles March 'Flowers' Challenge inspiration. 5. 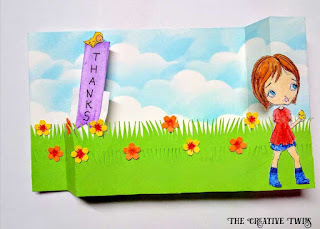 Kraftin kimmie stamp CHALLENGE #474 - SPRING! This is our DT project for Craftyscrappers. 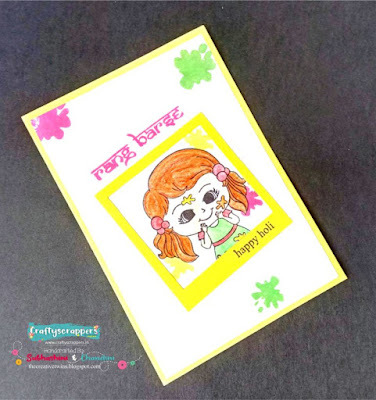 We have a pop-up box card to share with you today using Rang Barse stamp set. 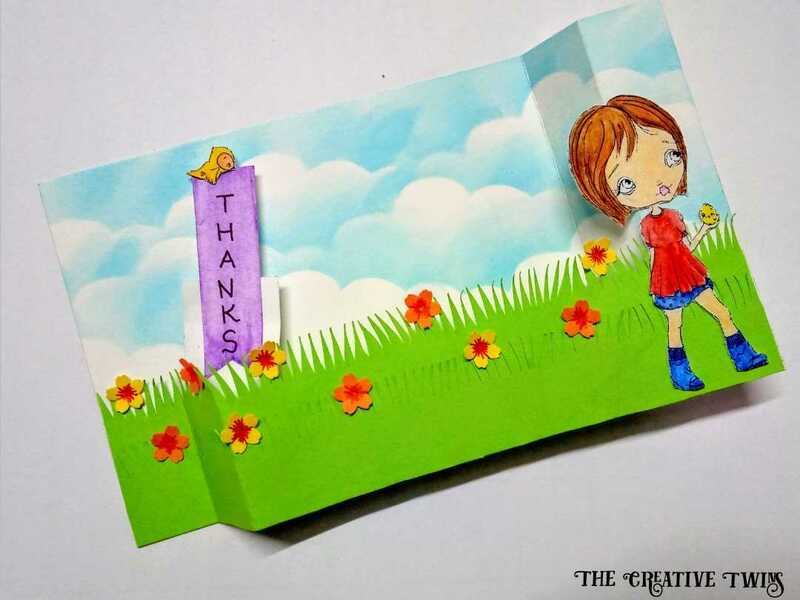 Pop-up cards are fun and interesting cards to give your loved ones. 1. 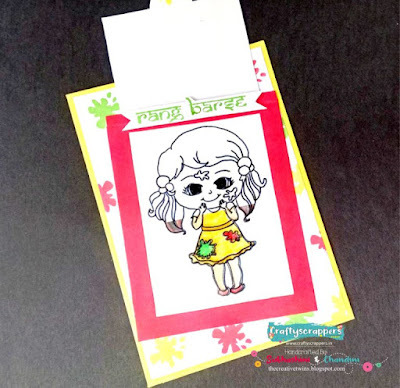 Stamp the girl, color plates onto white card stock with black ink. Color the girl using pencil colors. 2. Now in a palette, mix small quantity of shimmer paste and desired watercolor inks. This will give you colored shimmer paints. Use this to paint the color paints. 3. 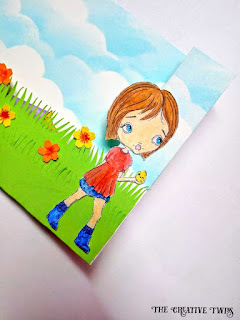 Use a paint brush to apply the above shimmer paints onto a white card stock, let it dry. On the back side, draw splashes and cut them out. 4. 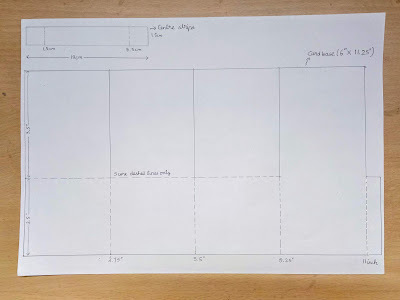 Measure 6.6 cm* 8.6 cm on a white card stock, cut four such rectangles. In three of the rectangle sheets, make water-colored backgrounds using watercolor inks. In the fourth plain sheet, stick the color splashes we made earlier in step 3. 5. 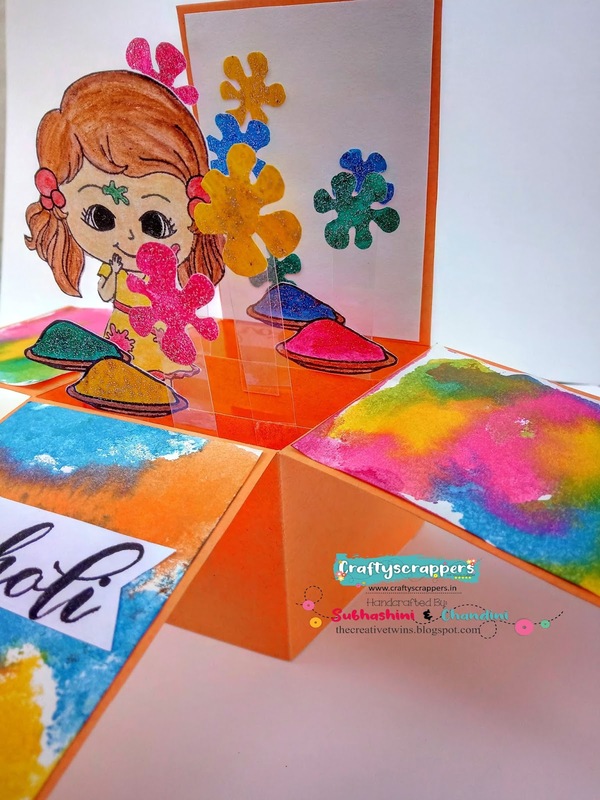 Stamp the happy holi sentiment on a piece of card stock, cut it. 6. 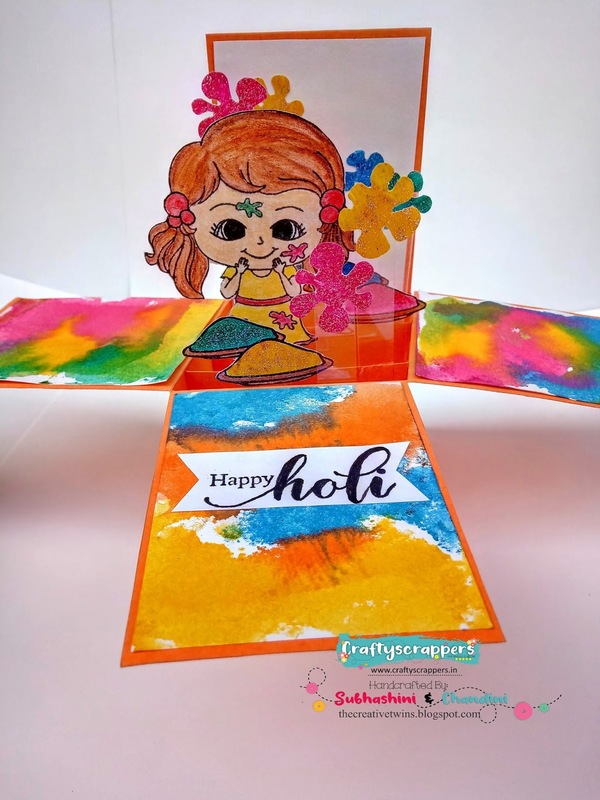 Stamp the small happy holi sentiment repeatedly using different colored inks on a piece of white card stock that is lightly smaller than 6 inch*2.75 inch. Paste color plates on a corner. 7. Cut 2 strips, each measuring 1.5 cm *10 cm, scoring at 1.5 cm and 8.5 cm. 8. 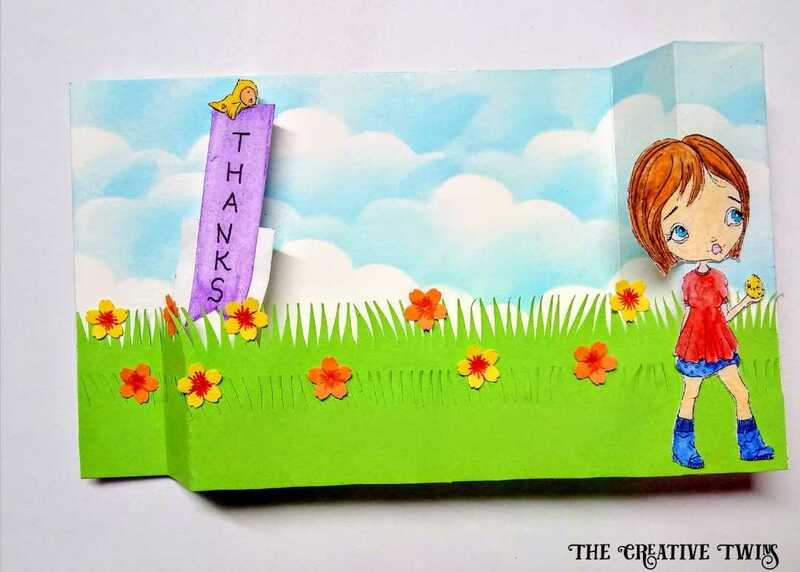 Cut strips of clear card element-1 cm wide in varying heights and adhere color splashes. 9. Now comes the assembling part, adhere the water colored panels on three sides of the card where we scored. 10. Stick the large panel (step 6) on the front of the card where we did not score. 11. Stick all the elements according to your choice. Now our pop-up box card is ready. Do give it a try, you will love it. Don't forget to participate in the ongoing challenge-“COLORS- speak louder than words!, to win exciting goodies. For more inspiration, visit here. 7. 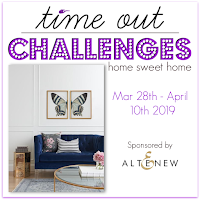 March "Show & Share"
21. 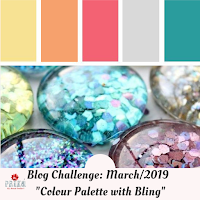 Prika Blog Challenge March-2019 : "Colour Palette with Blings"
We are here with a Wiper card, using digi stamp from Oddball Art, that we won in a challenge. This card is based on the theme- Be Grateful. We have for the first time used all the colors of rainbow together in a card. This is the first time we have created a scene, we don't usually do that. We punched out some flowers using a scrap piece of paper, and added tiny details using markers. We feel that those details on the flowers make them look realistic and lovely, don't you agree? 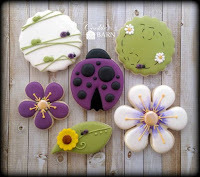 Aren't those tiny birds and flowers adorable? 1. TTC#9 - Be Thankful/ Grafteful + Use all colors of Rainbow! 9. 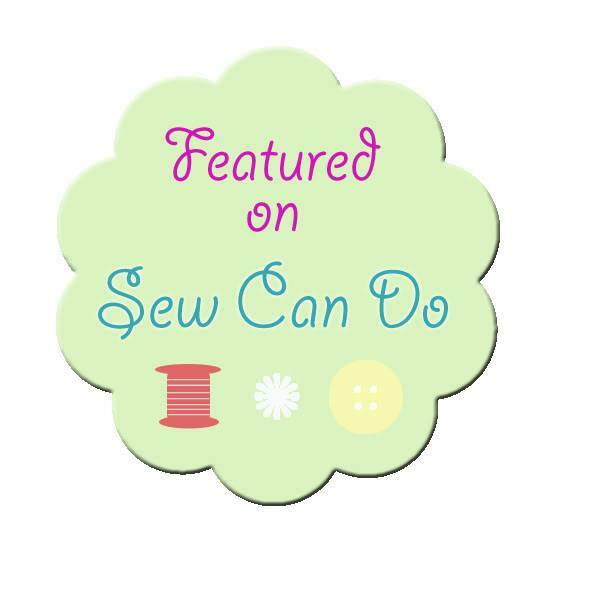 March "Show & Share"
This project is a part of the DT inspiration post for Craftyscrappers month of March. We have used Rang Barse stamp set from Craftyscrappers. 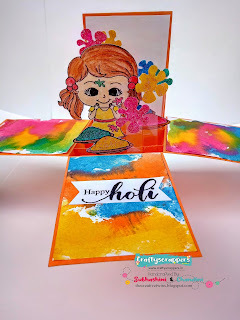 This card perfectly fits for Holi- the festivel of colors, right!! We have used this cute girl stamp as the focal point of our card and wanted to add a surprise element, hence thought of making Magic Slider card. Making the slider mechanism by hand without any dies is a task and needs lot of calculation and mind- boggling!!! We find it tough and decide not to do any magic slider cards in the future, but we somehow keep coming back to it (silly us). Does this happen to you as well? You can check our previous magic slider card here. 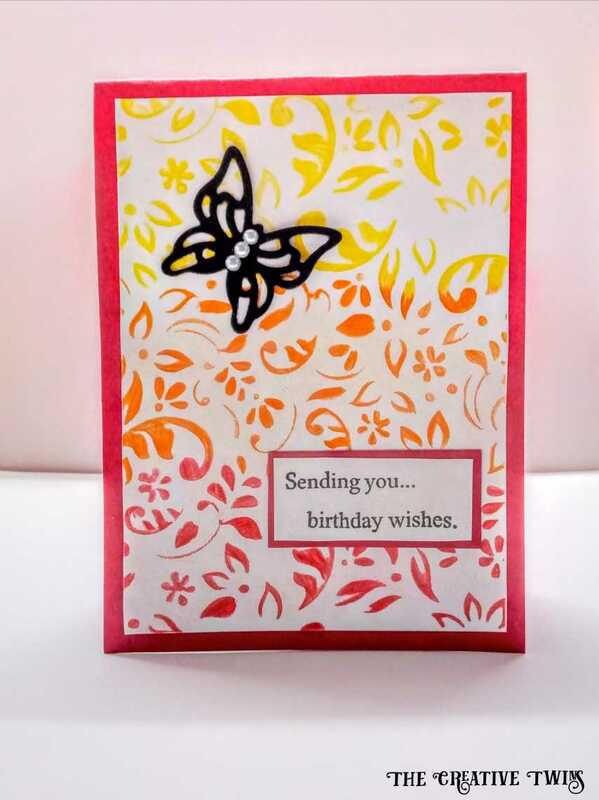 We repeatedly stamped the color splashes to form pattern paper and mounted it on colored card base. Our magic slider card is ready. 18. 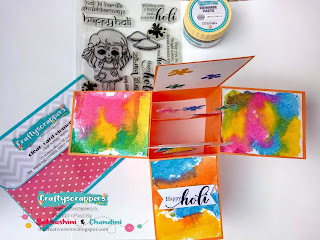 March "Show & Share"
We are here with our DT inspiration post for Craftyscrappers using their Holi stamp set- Rang Barse. 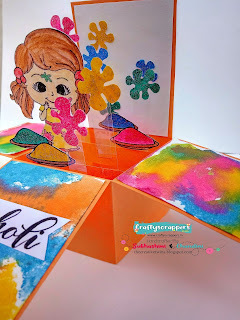 Holi is an Indian festival of colors. 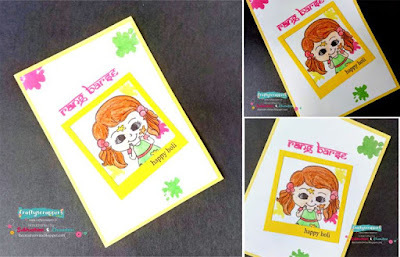 We have made this fun card with polaroid frame which is our recent favorite. 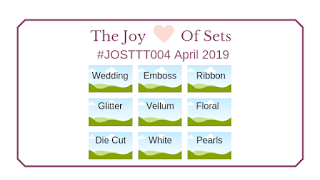 We have added splash of colors using a stamp from this set randomly. We thoroughly enjoyed making this card. 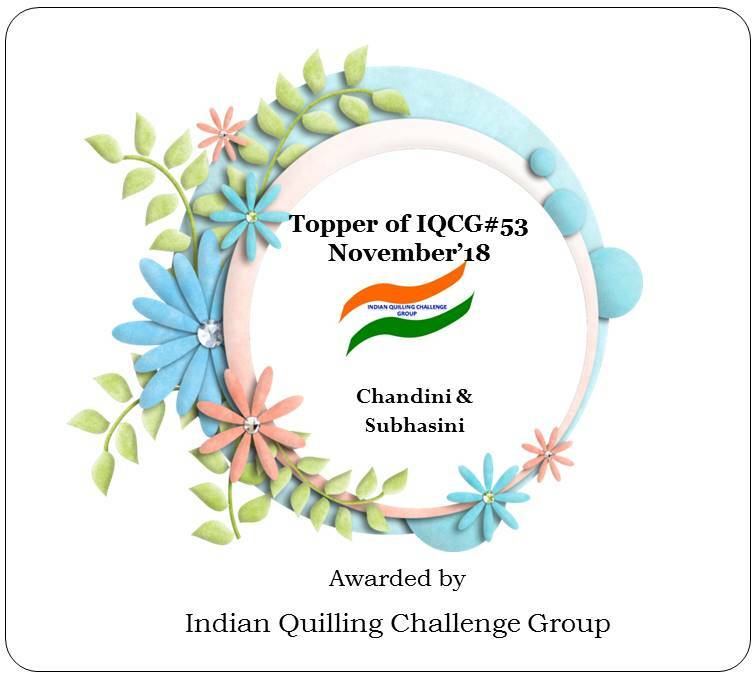 To know more on how we made this card, read this. 18. kraftin kimmie CHALLENGE #471 - TWO STAMPS! 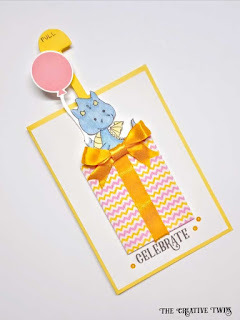 Back with one more greeting card using Craftyscrappers stamp- MAGICAL BIRTHDAY, we love this cute dragon. 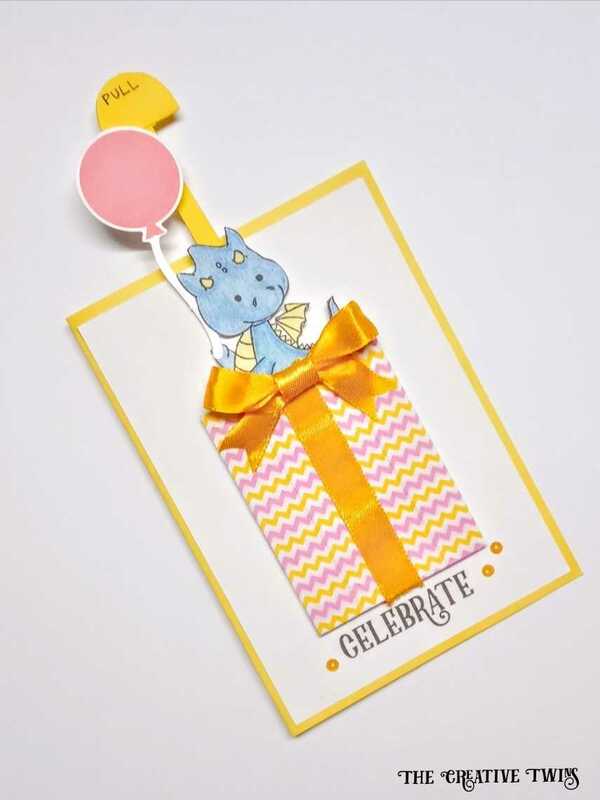 You can check our previous card using the same stamp here. 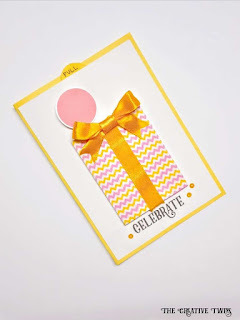 We have made a birthday card, who doesn't love surprises, right? We had surprise slider card in our to-do list for long, we finally made it. The gift is made using washi tapes and added a bow to complete the look (as we didn't have any pattern paper that would go well with this card or the color wouldn't suit with what we had in mind, then after breaking our heads for long, we thought to create pattern using washi tape from our stash. Don't you think washi tapes are cool?). We are happy with the outcome.